Emerging from the dense forests of Vermont, Bow Thayer & Perfect Trainwreck released their sophomore album, Bottom of the Sky, on November 16th. Recorded in the studio of longtime collaborator and friend, Levon Helm (drummer of The Band, and legendary solo artist), Bottom of the Sky showcases the band’s seamless melding of alt-folk, rock, and bluegrass, making for an easy comparison to Blitzen Trapper, the Drive-by Truckers, and the Felice Brothers. Featured tracks on Bottom of the Sky include the uplifting and mellifluous “Dawning” and the heartwarming yet not-too-sugary love song, “Epitome”. 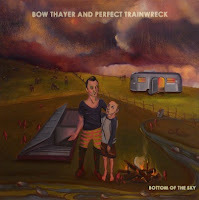 For Bottom of the Sky, Bow Thayer & Perfect Trainwreck worked alongside Justin Guip (Engineer on Levon’s Grammy-winning albums, Dirt Farmer and Electric Dirt) for a second time, to recreate the magic he helped capture on the band’s 2008 self-titled debut. The new album showcases Bow’s recent exploration of his beloved Deering electric banjo and effects boxes to create tones unlike any other.